At last, we come to the end of the trilogy… but we’re not talking about the newly-revived X-Men franchise, we’re actually referring to the unofficial superhero mash-up three-hander of 2016, which began with Batman v Superman: Dawn of Justice, continued with Captain America: Civil War, and now concludes with X-Men: Apocalypse. And boy, what an uneven trilogy it’s been. Failing at first to get off the ground with Batman v Superman, and then soaring into the stratosphere with Civil War, it all now comes crashing down with Apocalypse, which meets neither the highs of Civil War nor the lows of BvS, but is a bit of a let-down all the same, especially when you put it next to its actual predecessors. Following up on the same new timeline established in X-Men: First Class and X-Men: Days of Future Past, all seems to be peaceful at the home of Charles Xavier aka Professor X (James McAvoy), now fully established as an educational institute for young mutants, with even nemesis Erik Lehnsherr aka Magneto (Michael Fassbender) living a quiet life in a Polish steel factory with a wife and daughter. The disruptor to their peace, however, lies buried underground; the first-recorded mutant En Sabah Nur aka Apocalypse (Oscar Isaac), who has been trapped for thousands of years after an coup back in ancient Egypt, finally emerges and finds that society has seriously gone downhill. His solution? To destroy everything and everyone on the planet so he and a select few, including Erik who joins his small brigade after a tragic incident, can start again. This has Charles, shapeshifter Raven/Mystique (Jennifer Lawrence) and their students rather concerned, and they of course set out to try and stop Apocalypse and his four “horsemen” who consist of Erik, a young Storm (Alexandra Shipp), Psylocke (Olivia Munn) and Archangel (Ben Hardy). For a film that’s meant to apparently conclude the new X-Men trilogy, this one can’t help but feel unusually pedestrian instead of as epic as it wants to be. Much of it doesn’t thrill you as much as the last couple of ones did, with a lot of what we see here be either variations on things we’ve seen before or sometimes the exact same thing. Whether it be character arcs, villain motivations, lines of dialogue and sometimes entire action sequences, it’s all stuff we’re too familiar with at this point and nothing much seems to have been altered to make it exciting or even interesting. You know exactly what’s going to happen when characters converse about the goodness that’s still within one of them, especially to anyone who’s seen Return of the Jedi (which is incidentally referenced here when characters agree that “the third one is always the worst” – those in glass houses…); you know exactly the outcome that its big bad is going to suffer as a result of his dastardly plans, mostly because his is such a been-there-done-that motivation that it makes him one of the duller X-Men baddies in its on-screen history; and none of it is exciting because not only have we seen it before, but we’ve seen it countless times over so we’re too familiar with it by now. It’s more of a “Greatest Hits” album, when all we really wanted was for the band to put out some new material. While the X-Men universe has an endless amount of characters with their own unique abilities, if this film proves anything you shouldn’t put too many of them in one story, otherwise it’ll be far too crowded with not a lot even getting enough time to establish themselves. 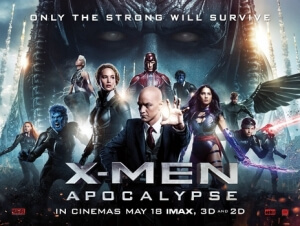 Aside from returning favourites like Professor X, Magneto, Mystique, Beast (Nicholas Hoult) and Quicksilver (Evan Peters), new additions (at least in this timeline) include young versions of Cyclops (Tye Sheridan), Jean Grey (Sophie Turner), Nightcrawler (Kodi Smit-McPhee) and Jubilee (Lana Condor) on top of Apocalypse, Psylocke, Archangel, Caliban (Tómas Lemarquis), and several other mutants who end up having to be background fodder – not to mention a terribly-kept secret cameo appearance from one mutant in particular – all of whom director Bryan Singer and writer Simon Kinberg want to establish as developed characters to add to the drama, but unfortunately just aren’t given as much to do as they may be aware. When it does focus itself on certain character arcs – Magneto’s is probably the most effective in the entire film, though that might partially be down to Fassbender’s commitment to the role – it hints at a much better film hiding beneath the surface, but there’s just all the rubble one has to dig deep within in order to just get a peek at what else could have been in store. X-Men: Apocalypse is a disappointment that neither lives up to the standards set by its more solid predecessors nor excites the audience thanks to an abundance of beats we’ve seen countless times before not being done much better here, and an overstuffed cast of characters that aren’t given enough time or focus to be truly satisfying additions to the story.